Good question! First, a brief rundown on why you might want to age meat. Conventional wisdom sites three specific goals to dry-aging meat, all of which contribute towards improving its flavor or texture. Moisture loss might be a major factor. A dry aged piece of beef can lose up to around 30 percent of its initial volume in water loss, which concentrates its flavor. Tenderization occurs when enzymes naturally present in the meat act to break down some of the tougher muscle fibers and connective tissues. A well-aged steak should be noticeably more-tender than a fresh steak. But is aged meat really better than fresh meat? It depends. I had a panel of tasters test meat aged to various degrees and rank them in overall preference, tenderness, and funkiness. Almost everybody who tasted meat that’s been aged for a couple of weeks—the period after which some degree of tenderization has occurred but seriously funky flavor has yet to develop—preferred it to completely fresh meat. On the other hand, folks were more mixed about meat aged longer than that. Many prefer the more complex, cheese-like flavors that develop with meat aged between 30 to 45 days. Some even liked the ultra-funky flavors developed in 45 to 60-day meat. Where you lie on that spectrum is a matter of experience. 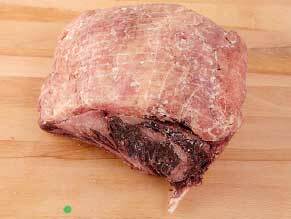 Dry-aged beef is beef that has been hung or placed on a rack to dry for several weeks. After the animal is slaughtered and cleaned, either the entire or half the carcass is hung, putting the carcass in a refrigerator unit, also known as a “hot box”. This process involves considerable expense, as the beef must be stored near freezing temperatures for 14 to 28 days. Because of this, dry-aged beef is seldom available outside of steak restaurants and upscale butcher shops or groceries. The key effect of dry aging is the concentration and saturation of the natural flavor, as well as the tenderization of the meat texture. Dry aging changes beef by two means. Firstly, moisture is evaporated from the muscle. This creates a greater concentration of beef flavor and taste. Secondly, the beef’s natural enzymes break down the connective tissue in the muscle, which leads to more tender beef. The process of dry-aging usually also promotes growth of certain fungal (mold) species on the external surface of the meat. This does not cause spoilage, but actually forms an external “crust” on the meat’s surface, which is trimmed off when the meat is prepared for cooking. These fungal species complement the natural enzymes in the beef by helping to tenderize and increase the flavor of the meat. The genus Thamnidium, in particular, is known to produce collagenolytic enzymes which greatly contribute to the tenderness and flavor of dry-aged meat. Dry-aged beef is typically not sold by most supermarkets in the U.S. today, because it takes time and there is a significant loss of weight during the aging process. Dry-aging can take from 15 to 28 days, and typically up to a third or more of the weight is lost as moisture. This type of beef is served in higher-priced steakhouses and by select restaurants. When beef is dry aged two things happen. First, moisture evaporates from the muscle creating a greater concentration of beefy flavor and taste. Secondly, the beef’s natural enzymes break down the fibrous, connective tissue in the muscle, tenderizing it. Most of the tenderizing activity occurs in the first 10 to 14 days. Up until 20 years ago, dry aged beef was the norm, then with the advent of vacuum packaging along with increased efficiencies in beef processing and transportation, we lost the dry aging process. 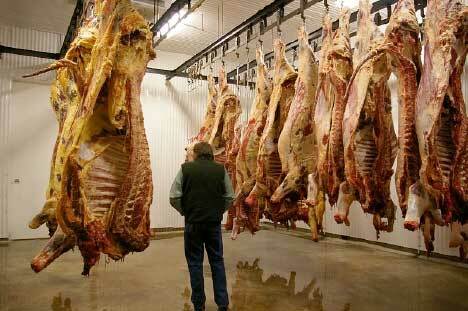 In today’s modern processing plants, the carcass is broken down and vacuum-sealed in plastic bags within 24 hours. Much of this beef will show up in a grocery store meat case within 2 to 4 days after harvest. Beef can be “wet aged” in a vacuum-sealed plastic bag for improved tenderness but it will not have the characteristic dry aged flavor. Because long-term refrigerated storage is expensive, dry aged beef is not typically sold in supermarkets.